This page is here to help you begin the research process. It covers where to find reliable resources, locating your sources (search strategies), and evaluating sources. You can start searching NewSchool resources via our Research Page. Find articles, browse digital magazines, read ebooks, and more! #1) The Library Catalog for BOOKS! Search the NewSchool Library Catalog via the library website to find books, ebooks and past student thesis in our collection. Search five databases simultaneously through EBSCO to find resources on architecture, design, construction and related topics. Limit you search to Full Text to search for articles available online as pdfs. Limit your search to Periodical Holdings to search print magazines and journals held in the library. Check out the Library A-Z Database List to see all databases you can access. #3) Subject Guides for resources by topic. We have resources on Architecture, Construction Management and Design. View our full list of subject guides to explore by topic. This 9 story public library is just six blocks from NewSchool. It's free! With a San Diego Public Library Card you can also access The San Diego Circuit to search the collection of SDSU, UCSD and USD and request resources through interlibrary loan! Google Scholar is a great tool to search for articles online. If the article is available for download, it will have a PDF icon on the right-hand side of the search result. The term Information Literacy is used by librarians to describe a series of skills. These are the ability to find information,evaluate information for quality, and effectively use information for research. Information Literacy is also important for people in creative fields because they need to be able to correctly inform their work, reference predecessors and contemporaries without plagiarizing, engage in historical and contemporary dialog about their field, and meet professional expectations of subject expertise. The research process is not linear-- it does not go from point A to B. Instead, you may find yourself going back and forth between steps, refining your topics as you discover more information, or changing your thesis statement to be either more broad or narrow, depending. This is a natural part of the process. Don't be discouraged! You can jump straight into some background research, or you may want to start by defining your topic. This step is found in our How to Write an Academic Paper guide. Just like the best meals start with quality ingredients, so does the best research papers start with quality information sources. This video gives a brief explanation of what scholarly resources are, and where to find them. Misinformation: websites are organized by popularity rather than quality. So, often the most sensational websites are listed first. Information Overload: search engines are likely to bring back thousands of results. Anyone can create a website: it is important to be aware of the agenda and biases of corporate and commercial websites, as well as those created and maintained by unqualified individuals who are presenting their personal interests and perspectives. Information accessible on the open web should be suspect unless it is informed by scholarship or scholarly investigation. Avoid .com and .net sites unless they include primary source material. More reliable information can be found at .gov, .edu, and sometimes .org (in the case of most museums and public broadcasting) sites. After you've decided where to look (be it in a library database, or on the shelves) you need to search for relevant materials on your subject. To begin you need to think about what you'd like to write about (e.g. an architect, a building, comparing several theories) and then you need to create an opinion about it. But how do you decide what you want to express and find out if there are scholarly resources to support it? Following this workflow will ensure we have all the information we need to write a strong research paper. Topic: What are the effects of spanking on children? 2. Group these according to concept. Use quotations marks around words you want to search as a phrase, e.g. "physical punishment"
Peer Reviewed: Only brings up articles that have been evaluated for quality by scholars prior to publication in your search results. Wildcard: Use a ? or * in place of a word to search for part of a phrase, eg. "The devil is in the *. Truncation: Use an asterisk (*) to retrieve all possible endings on a word. Appropriat* will bring back results for appropriate and appropriation. Boolean Operators: Use AND, NOT, OR, to join or exclude terms. Be prepared to search more than one database. Always revise your search strategy to comply with individual database requirements. Great Job! You've found some materials on your topic from a variety of sources: websites, books, and journals. Next, you need to evaluate the quality of the information. Be skeptical. Ask yourself, is this information CRAAP? Current: When was this source published? How recent is this information, and is there somewhere that has more up-to-date information? Relevant: Does this information relate directly to my topic, or is it covering something else? Accurate: Can I cross-check the facts in this source? Do they include a bibliography so that you can see where they got their information? Does the information in here corroborate with other sources on the same topic? Purposeful: What is the purpose of this paper? Can you see any bias or conflict of interest? Remember, academic papers are expected to have good quality sources. Only use sources that pass the CRAAP test. Now that you've found and evaluated all your sources, you need to use the information to inform your paper. Using information that you did not create requires you to cite your sources (otherwise you are plagiarizing!). Use the APA Citation Help guide to walk you through using information ethically. 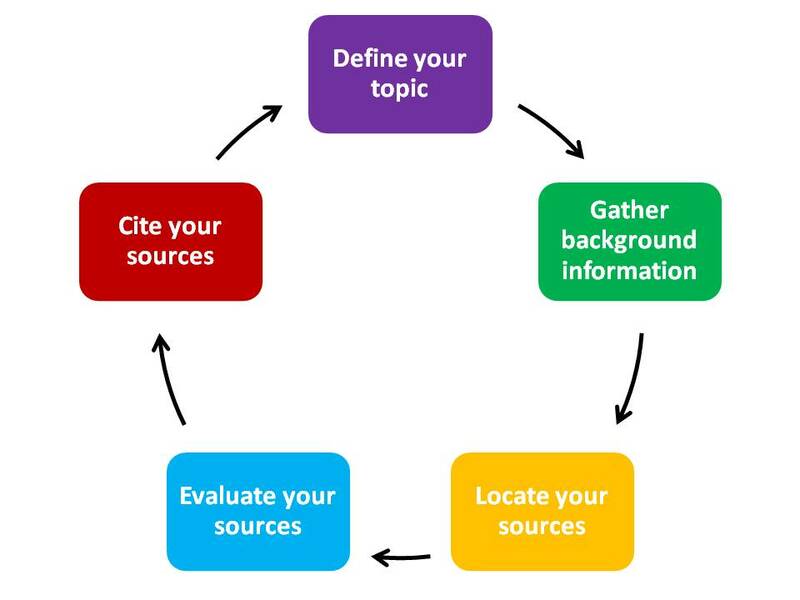 Lymann Beecher Brooks Library, Introduction to Research: Research Process/How to... retrieved from http://libguides.nsu.edu/c.php?g=179148&p=1192526.